Ladies and gentlemen, we're now five months into the year, and we can declare the 2014 edition of the flagship derby in full swing. Arriving third on the scene is Sony's refresh of the Xperia Z1 in the Xperia Z2, and despite it being chock-full of promise, the competition is not about to let it have a field day. Prime among the Z2's rivals is Samsung's equally solid new Galaxy S5. Truth be told, Samsung's new top shelfer has quite a bit going for it. 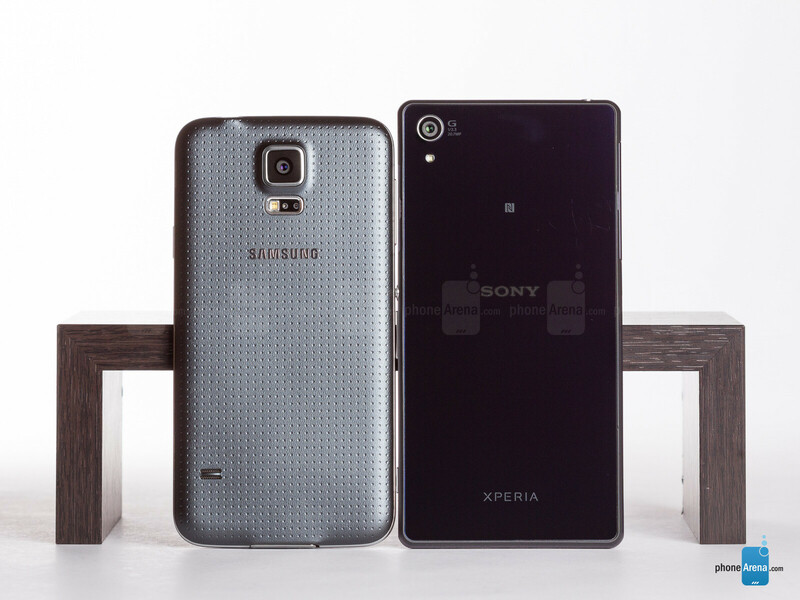 Which is all the more reason to be impressed by the Z2, which seemingly has a leg up on it. At least on paper. Indeed, the flagship Xperia has the slightly more remarkable body and the slightly bigger screen, battery, and pixel count on its camera. 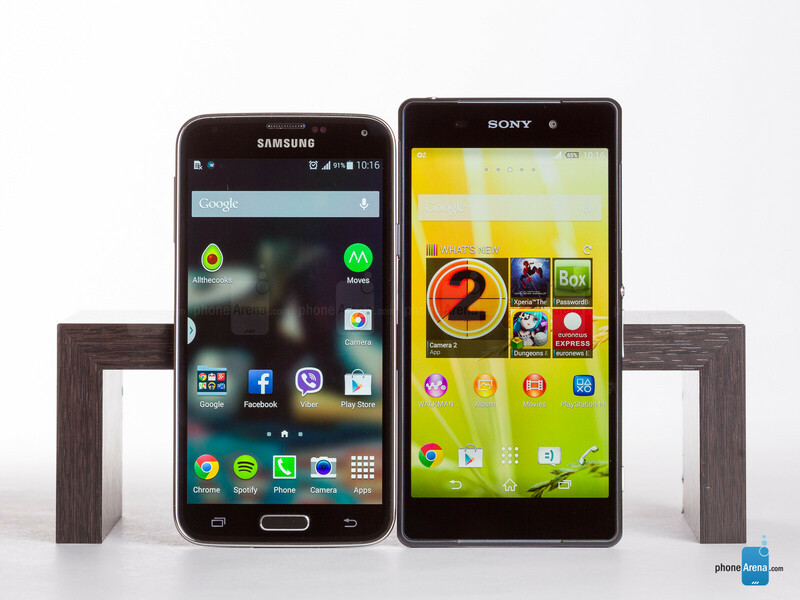 Does that necessarily make the Xperia Z2 the slightly better device? Take them eyes off that specs chart and join us in order to find out. 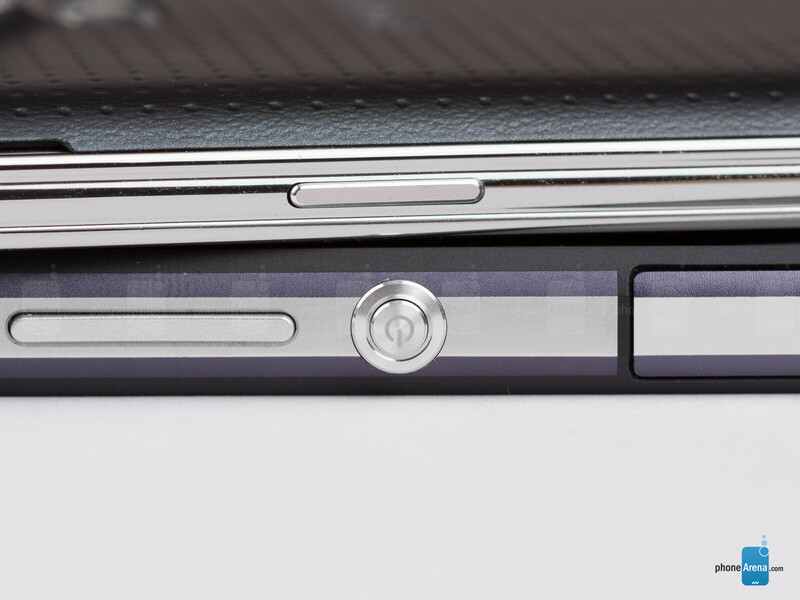 The Z2's rectangular and clear-cut, glass-and-metal body looks nothing like the S5's more-ergonomic, rounded plastic. Design-wise, Sony and Samsung have taken two differing approaches, and even a cursory glance reveals them. Rectangular in nature, the Xperia Z2 is the bulkier of the two, and is on the heavy side at 163 grams (5.75 oz). In comparison, the 145 gram (5.11 oz) Galaxy S5 is more lightweight, and its rounded form factor makes it the, hands down, more ergonomic device to hold. That said, the S5's all-plastic exterior appears modest next to the glass-and-metal Z2. A choicer pick of materials may not have necessarily been on the mind of Samsung, but it did borrow a page off Sony's book: IP certification. More specifically, the IP67-rated S5 is now neck-and-neck with the IP58-certified Z2 in what is becoming an increasingly sought-after department. Put in layman's terms, the two otherwise cryptic abbreviations certify the two devices' ability to withstand dust or water ingress. It's worth pointing out that the S5 is completely dust-tight, while the Z2 is the slightly better swimmer. Of course, this back-and-forth didn’t stop there, and the port flaps-cluttered Z2 still is a bit of a sore sight for the eye, whereas the S5 sports the more simplistic, flaps-free frame (save for the microUSB port). The S5 also proves superior as far as navigating the power and volume buttons go – they’re clickier, and not as sticky as with the Z2 – though it does lack the dedicated, two-step shutter key of Sony’s flagship. Sony is finally doing it: the Xperia Z2's IPS panel proves a step ahead of the AMOLED panel on the Galaxy S5. Looking back, both Sony and Samsung have had a shaky record, at least as far as the quality of their displays is concerned. For its part, Sony kept insisting on using inferior TFT panels with poor viewing angles and washed out colors, while Samsung's bet with AMOLEDs has often been criticized for its inaccurate color reproduction and relatively low peak brightness. As almost every other thing in this industry, however, improvements have been made. Starting with the 5.2-inch, 1080p screen on the Xperia Z2, we finally see Sony thaw and adopt IPS (In-Plane Switching) tech. The panel in question has a very good color temperature of 6909 K (so whites appear white), and peak brightness, at about 460 nits, is also up to speed and allows for outdoors use. At 2.59, gamma isn't as excellent, but that's far from a deal-breaker. Speaking of colors, those are over-saturated on the whole, but overall reproduction is acceptable. 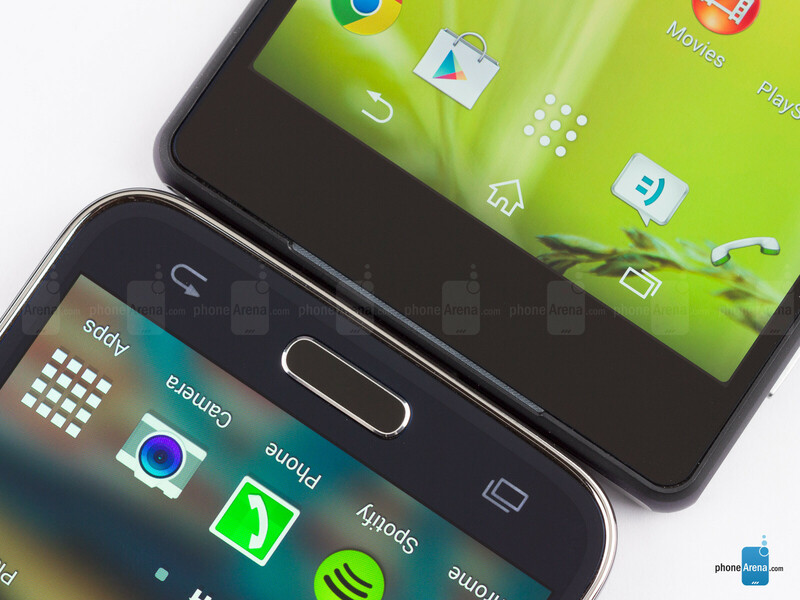 In comparison, the 5.1-inch, 1080p AMOLED display on the S5 is, strictly speaking, a tad inferior. It's got a cold color temperature of 8183 K, and this leads to some notably bluish whites and messed up shades of gray. Peak brightness is also a notch lower, at 442 nits (but still enough for use outside), and gamma, at 2.25 is pretty spot on. As for color reproduction, Samsung's panel offers heavily-saturated and notably incorrect colors. Head to head and cut to cut.... Nice article Chris. I have the Z2 and most of my friends have the S5. I have to admit that I prefer the screen of the S5 and the colour reproduction is no where near inaccurate. But I'll never trade my Z2 for the S5 though. In movie and pro photo mode the temperature 6500K, also they have 106-107% SRGB, its better than 130% in Z2. forum.xda-developers.com/showthread.php?p=52446659​​#post52446659 brightness at s5 in a auto mode is 698. also much better antiglare At Z2 130% SRGB. All image are designed for SRGB standard (99.9% of the colors in nature), and enhanced range is color distortion, oversaturation and red hues. Lack of OIS No isocell (isocell have better color, better dynamic range) No oled (oled have ideal black color, ideal contrast, ideal viewing angle, ideal response speed, all much better than lcd) Weak sound in headphones Large energy consumption (3200 mah batery life less then 2800mah S5 and 2600 mah M8) FBReader Video 3D Games HTC M8 2600 mА·h 22 h. 10 m. 13 h. 20 m. 3 h. 20 m. Galaxy S5 2800 mА·h 17 h. 20 m. 12 h. 30 m. 4 h 30 m. Xperia z2 3200 мА·h 15 h. 20 m. 11 h. 00 m. 3 h. 30 m.
TL;DR version please and clickable links. What is this? I didnt get anything. Downright confusing. PA battery life test only involve 1 type of test... GSMArena test 4 areas: Talk time, Web Browsing, Video Playback and Stand By... then they make an average out of them... In my opinion GSMArena has a much more comprehensive and complete Battery life test... and c'mon buddy... dont bring hashtags crap here... it doesn't make your post look good. So no isocell has become a dealbreaker huh. Cool. Unnatural DR and oversaturated photos of the S5 cancel your argument very quickly. Also, please stop posting unclickable links! I have not seen the video tests though. You never handle DSLRs, do you? At S5 DR better than bsi in smartphones, but not better then bsi in DSLR, because smaller sensor. Colors at S5 better then bsi in smartphones and bsi in DSLR. Less electrical crosstalk between pixels. The excess charge less spreads out in the wrong cell. More photons exactly comes with microlenses and going in the right photodiode. My Point is, A good DSLR Photo doesn't oversaturate things like the S5's camera does. Less electrical crosstalk means that colours will not be flexible, hence the result is some oversaturated pictures and unnatural colours. A good DSLR can be a 'reference' to compare good smartphone cameras. There is nothing wrong with talking about DSLRs here. I don't wanna believe untrusted sites. How they showed the details that the Z2 captures baffles me. hahaha... really? I own my z2 and taking photos they were never blurred in the background.. did they clean the lens from fingerprints... Total fake or old software. As also the kidding sharpness of sgs 5.. Tried them both in same occasion and place.. Z2 was not far worse than S5 but still a first class in compact cams, and hits perfectly clear macro scene, next time use a cam holder if you have shaky hands. I know that. What I'm talking about was how it produces more saturated pictures than BSI, which is not nice considering that saturation is oversaturated (at least for me). And I have many friends who agrees with me.